As the 143rd and 142nd Infantries advanced on the approaches of Luxeuil, the Germans put forth increasing resistance. In the sector outlining the towns airport, our troops ran into a flock of German flak wagons. Flanking well to the east, the attack progressed throughout the night of September 15, until the exits from the city on the east were severed. 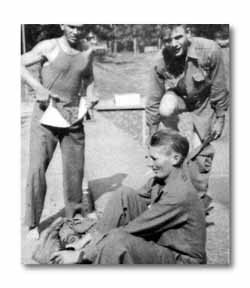 In the morning at 1000 hours the 143rd broke into the town and found that the enemy had pulled out. Intense fighting continued with the 142nd in the forests east and north of the city. Luxeuil, with its hot sulfur spas, dating back to Julius Caesar, was a fine spot for the Division to pause momentarily while tired troops alternated in taking breaks and hot showers. Reconnaissance units kept tabs on the fleeing Germans. A flour manufacturer and 11-year-old daughter gave a bottle of wine to T/SGT. Joe Tredenick of 141st. 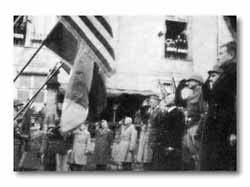 IN WORLD WAR I an heroic group of American volunteer pilots, "LEscadrille La Fayette," was based in Luxeuil. 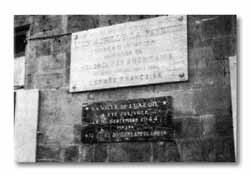 A plaque commemorating the volunteers, and another in honor of the World War II liberation, have been mounted on the wall of the town hall. ON ARMISTICE DAY, November 11, 1944, the citizens of Luxeuil honored divisions of the Seventh Army instrumental in driving out the Boche. At right the Mayor is flanked by Generals Dahlquist and Patch. 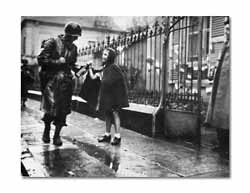 After the Germans had gone, the people of Luxeuil swarmed out into the streets and down to the city hall. The FFI quickly rounded up resident collaborationists and shaved their heads to the delight of an unpitying mob. 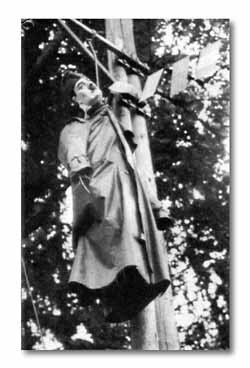 Giving vent to long repressed hatred, they suspended an effigy of Adolph Hitler from a telephone pole. Several hundred American doughboys joined with the natives in their celebration, but most of them preferred to loll in Luxeuils warm baths.